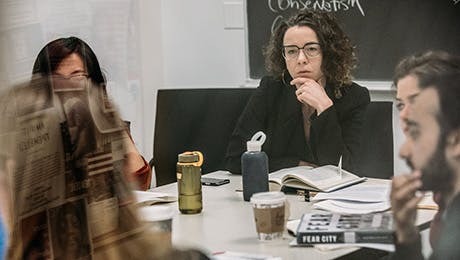 The Office of Academic Affairs administers institutional scholarships, fellowships, and assistantships at The New School for Social Research and also advises students seeking external funding. The Provost's Office coordinates the Teaching Fellowship program and teaching assistantships for undergraduate courses and offers support to students seeking external funding, specifically dissertation research grants. Student Financial Services offers a comprehensive program of financial services for all matriculated students, including institutional scholarship support to eligible students on the basis of merit and need and information and assistance with U.S. government loan programs and work-study. The school awards scholarships on an annual basis. The fellowship and special scholarships application deadline for new students is January 7; the scholarship application deadline for continuing students is March 1. The following materials and procedures are used in the aid application process. See the institutional funding link for more information. Students who complete the application process by January 7 will be considered for full fellowship awards. Applications received or completed after January 7 are considered for partial scholarship awards and other forms of financial aid on a rolling basis. Prospective students should visit our admission page for more information. Students already receiving scholarship support do not need to submit a new application. Students must submit an additional application and supplemental materials to apply for the University Fellowship, the Statue Foundation Fellowship in Clinical Psychology for Immigrants and Refugees, and Dissertation Fellowships. These forms are available in the Office of Academic Affairs and online at the beginning of the spring semester. The deadline to apply is March 1. Information regarding department assistantship application procedures and forms are available in the Office of Academic Affairs early in the spring semester. The deadline to apply is March 1. The Provost's Office offers eligible graduate students teaching assistantship and fellowship opportunities, which require them to assist with or teach undergraduate courses. Information and application forms are available on the provost's website.